THESE PEOPLE ARE INSANE AND JUST CAN’T ACCEPT THEY LOST TO DONALD J. TRUMP … TALK ABOUT YOUR SORE LOSERS!!! By the way the Democrats and Hillary have acted since the 2016 elections, thank God Donald Trump won. Hey DNC, Democrats and the LEFT, don’t ask for things they just might come true. For nearly a year Special Counsel Robert Mueller has been trying to find evidence of collusion between Russian and Donald Trump and has discovered butkis. Now, with Mueller floundering to find any crimes to pin on Trump, FBI former #2 Andrew McCabe in hot water after the DOJ’s Inspector General, FBI’s former #1 being looked at for leaking classified info, the deep state being exposed … we get this classic that the DNC is suing Russia, WikiLeaks and Trump campaign for interference in the 2016 election. UNREAL. They LEFT just cannot accept that they lost to Trump. The DNC is seeking recompense for what it says was millions of dollars in damages from Russia’s hacking of its internal emails, which were then published by WikiLeaks, with the encouragement of then-candidate Trump and his campaign. REALLY? This from the same people who never let the FBI examine their servers after the so-called hack. What were they afraid of, that is was an inside job? The Democratic Party on Friday sued President Donald Trump’s presidential campaign, the Russian government and the Wikileaks group, claiming a broad illegal conspiracy to help Trump win the 2016 election. The multimillion-dollar lawsuit filed in Manhattan federal court says that “In the Trump campaign, Russia found a willing and active partner in this effort” to mount “a brazen attack on American Democracy,” which included Russian infiltration of the Democratic Party computer network. The DNC is playing a very dangerous game. They are in full on “resistance” mode all they time, which is growing really old. I have one thing to say to the DCN, you better be prepared for “discovery”. Maybe we will find out once and for all that they DNC was not hacked, but an inside job. The Democrats have nothing but to cause chaos. I cannot wait for this to backfire on them. You have been warned. The Democrats and Hillary Clinton have been the biggest bunch of sore losers ever. Hillary Clinton was a terrible candidate, hell she lost to an unknown Obama 8 years earlier. Now sour grapes Hillary who just cant let it go blames everyone else in the word but herself, Hillary Clinton on Election Night: ‘They Were Never Going to Let Me Be President’. Good grief folks, does it ever jut dawn on you by they way you and she is acting is the reason why you lost? The Dems better hope this case gets tossed on summary judgement, because the ultimate destruction of the Democrats will be when Julian Assange states he received the emails from Seth Rich. The Trump campaign called it a “sham lawsuit” and said it smacks of desperation on the part of the DNC. Gee, ya think? RUTH BADER GINSBERG NEEDS TO STEP DOWN … NO ONE THIS POLITICAL NEEDS TO BE ON THE SUPREME COURT. When will the LEFT let it go? Folks, its been more than a year since Hillary Clinton lost the 2016 presidential election in an electoral landslide. An election that many said she could never lose. However, that’s why they play the game and the LEFT still cannot get over it. In an interview this past Sunday at Columbia University during a Women’s Conference Supreme Court Justice Ruth Bader Ginsburg said, “I think it was difficult for Hillary Clinton to get by even the macho atmosphere prevailing during that campaign, and she was criticized in a way I think no man would have been criticized.” This was a doubling down on comments she made last year that sexism “no doubt” played a role in Hillary Clinton’s 2016 election defeat. Good grief, REALLY? Where does this 84 year old Supreme Court justice get off being so political? She needs to step down if she is going to act in such a political and bias manner because obviously, by her own words and actions she can no longer be fair and just. A note to Ruth Bader Ginsburg, Hillary Clinton lost because she was a terrible candidate. In a change election, the Democrats nominated the most establishment candidate ever. America had Clinton fatigue and were tired of her corruption, scandals and lies. It is only those in Leftist group think that blame sexism for her loss. As it was she rigged the Democrat system against Bernie Sanders in the primaries, of which she barely won. I am curious, was it also sexism that caused Hillary to lose to Barack Obama in the 2008 primaries? 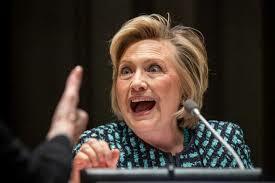 Hillary Clinton has spent most of her days, post-election, pining about her loss and blaming it on the deplorables who followed President Donald Trump — the so-called sexist, misogynist atmosphere she perceives as marking her race to the White House. Well now, here comes Supreme Court Justice Ruth Bader Ginsburg, tossing the same gender card. And not for the first time, either. When asked by CNN’s Poppy Harlow during a Columbia University forum to clarify her previously made comments about sexism during the election year — that it was a “major factor” in determining the outcome — Ginsburg didn’t walk back, but rather ran head-first forward. “I think it was difficult for Hillary Clinton to get by the macho atmosphere prevailing during that campaign,” Ginsburg said, The Hill reported. “[S]he was criticized in a way I think no men would have been criticized. I think anyone who watched that campaign unfold would answer the same way I did, yes, that sexism played a prominent role. In other words, Clinton was held to account on pretty much gender neutral political platforms. She was questioned about most of the same issues as Trump — except Trump, of course, was slapped hard for his past treatment of and remarks about women. If anyone was subjected to gender-based questioning, it was Trump, not Clinton. Ginsburg, however, has described herself as a “flaming feminist litigator,” CNN reported. And she’s a flamer, apparently, who made widespread news for her inappropriate — for a supposedly unbiased court justice — who spent the pre-election weeks condemning the idea of a Trump presidency, wondering “what the country would be” with him in the White House, and threatening, maybe somewhat jokingly, maybe somewhat not, to move to New Zealand. How long is the LEFT going to whine over Hillary Clinton’s loss? GET OVER IT AND MOVE ON!!! How satisfying is it going to be when a Republican, preferably President Donald Trump gets to nominate her replacement on the Supreme Court? RETIRE? HE NEEDS TO BE FIRED AND PROSECUTED!!! As reported at The Hill, FBI Deputy Director Andrew McCabe is planning to retire in the coming months amid accusations from Republicans of partisanship and bias within the law enforcement agency. WHAT? This corrupt SOB needs to be fired prior to being fully eligible for any pension. Then he needs to be prosecuted and thrown in prison for his part in trying to alter an election. Of course his decision to retire has nothing to do with the fact that McCabe sat before three congressional committees this week, where he faced questions about his conduct and the FBI’s handling of the investigations. DRAIN THE SWAMP, FIRE THIS GUY AND INDITE HIM!!! As reported at The Daily Caller, McCabe’s departure comes days after The Post reported that FBI general counsel Jim Baker will be reassigned. THE COLLUSION WAS BETWEEN THE FBI & DOJ TO PREVENT TRUMP FROM BEING PRESIDENT!!! FBI Deputy Director Andrew McCabe is planning to retire in the coming months amid accusations from Republicans of partisanship and bias within the law enforcement agency. The Washington Post reported Saturday that McCabe plans to step down in a few months, when he is fully eligible for pension benefits. That is expected to happen in early March. McCabe has weathered GOP criticism of the FBI for over a year, with Republicans questioning the agency’s handling of the investigation into Hillary Clinton’s use of a private email server and, more recently, the probe into possible collusion between President Trump’s campaign and Russia. The deputy director faced particular criticism after it was revealed that his wife, who ran for Virginia state Senate in 2015, received hundreds of thousands of dollars in campaign donations from a political action committee led by Virginia Gov. Terry McAuliffe, a Democrat with close ties to the Clintons. Was the Steele Dossier the FBI’s ‘Insurance Policy’? Remember the text of the meeting when FBI agent Strzok met in McCabe’s office ahead of the 2016 Presidential election and stated that even though there was no way Trump could get elected and a Trump victory was the longest of long shots, the FBI “can’t take that risk” and he insisted that the bureau had no choice but to proceed with a plan to undermine Trump’s candidacy with this insurance policy … “It’s like an insurance policy in the unlikely event you die before you’re 40.” National Review asked the question, was the Steele Dossier the FBI’s insurance policy? As unbelievable as it seems, it appear to be true. The FBI used this ridiculous and discredited document to start the wheels in motion to gain the FISA warrants to undermine a presidency and start a coup. Individuals don’t just need to be fired, they need to be sent to prison. The FBI’s deputy director Andrew McCabe testified Tuesday at a marathon seven-hour closed-door hearing of the House Intelligence Committee. According to the now-infamous text message sent by FBI agent Peter Strzok to his paramour, FBI lawyer Lisa Page, it was in McCabe’s office that top FBI counterintelligence officials discussed what they saw as the frightening possibility of a Trump presidency. That was during the stretch run of the 2016 campaign, no more than a couple of weeks after they started receiving the Steele dossier — the Clinton campaign’s opposition-research reports, written by former British spy Christopher Steele, about Trump’s purportedly conspiratorial relationship with Vladimir Putin’s regime in Russia. Obama-era FBI and Justice Department had great faith in Steele because he had previously collaborated with the bureau on a big case. Plus, Steele was working on the Trump-Russia project with the wife of a top Obama Justice Department official, who was personally briefed by Steele. The upper ranks of the FBI and DOJ strongly preferred Trump’s opponent, Hillary Clinton, to the point of overlooking significant evidence of her felony misconduct, even as they turned up the heat on Trump. In sum, the FBI and DOJ were predisposed to believe the allegations in Steele’s dossier. Because of their confidence in Steele, because they were predisposed to believe his scandalous claims about Donald Trump, they made grossly inadequate efforts to verify his claims. Contrary to what I hoped would be the case, I’ve come to believe Steele’s claims were used to obtain FISA surveillance authority for an investigation of Trump. Yesterday, on the one year anniversary of the 2016 election, President Donald Trump took to his Twitter account to congratulate the “Deplorables.” President Trump tweeted, “Congratulations to all of the ”DEPLORABLES” and the millions of people who gave us a MASSIVE (304-227) Electoral College landslide victory!” Hillary Clinton called Trump supporters a “basket of deplorables” and they all got a good laugh. Hmm, who is laughing now Hillary. Her comment came back to boomerang on her and rallied support for Trump. 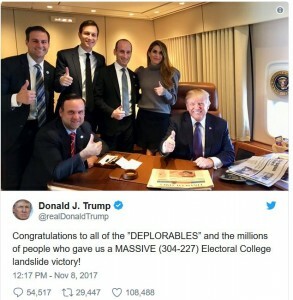 Do you remember what you were doing one year ago that day when Donald Trump shocked the political world, the pundits, the pollsters and the liberal media. They still have not gotten over it.